Tell us about Kanche result? I am quite happy for the entire team as the hard work was paid off. My debut film Mukunda character had one dimensional character. Kanche gave me enormous scope to perform. How was the response from your family? Tell us how Loafer did happen? I had been wanting to do a film in Puri Jagan direction. And it was a god sent opportunity. I went to his office and he narrated some other story first. He also knew that I give utmost preference to story. Then he narrated Loafer story and I liked it immensely. I look for three things while selecting a script. 1. story, 2. characterization, 3. a director who can do justice to the story. Loafer has good story, good characterization and a great director. What kind of story Loafer offers? It’s an emotional film. It’s about a son who goes away from his mother and then gets back to her again. It’s a mother-son story. Revathi and Posani Krishna Murali did the characters of my parents. I play the character of Raja who is a casual guy with abundance of energy. It’s a typical Puri Jagan’s character with loads of emotional scenes. Loafer is your 3rd film. Is acting comes easy now? It was a difficult and unusual character in Mukunda. Kanche film has a character that gets fame to actor and gives immense satisfaction. It was very difficult one. Loafer’s character is the most easiest for me as it’s a pretty casual character that infuses typical Puri Jagan’s body language. Some people are so reserved in real life and pretty casual and spontaneous while doing characters in films? What kind of a guy are you in real life? I am pretty casual with friends. But reserved with others. Puri Jagan is a kind of director who brings the best spontaneity out in you. You looked uncomfortable with dances in Mukunda and you were at home while dancing for a song in Kanche. How about your dances in Loafer? Brunda master has loosened me up for the song in Kanche. Dinesh master understood my strengths and shortcomings and composed dances to suit my body language. Actor Sunil suggested me that we should dance in our comfort zone instead of trying to be others. I follow that principle. What’s your observation about three heroines you worked so far? I had almost no interaction with Pooja Hedge as both characters does not meet till interval. Pragya Jaiswal is a fabulous actress. Disha Patani is the one with whom I have a lot of comfort. She is the best dancer among them all. How is the experience of working with Revathi? We were shooting for an emotional scene and Revathi spent time alone in that mood for 45 minutes prior to the shooting of that scene. She told me that there are around 7/8 scenes in every film where we must concentrate. She taught me a lot. We can’t imagine any other actress in Revathi’s role in Loafer. Tell us about Loafer locations? As per the story, first half happens in Rajasthan and second half happens in a beach village in coastal Andhra. We shot the first half in Jodhpur and second half in Goa. Your father made good films. At times, he has struggled as producer. How are you treating your producers? I always keep producer’s comfort as my first priority. I don’t know if revealing it now is correct or not. But I didn’t take remuneration for Kanche film as it was produced on a budget that is beyond my market. But producers gave me remuneration from the earnings after the film’s release. Story and script is the main criteria for me, not remuneration. That’s why producers of my first three films are willing to produce films with me again. Heard that you wanted to become a director once? I used to have the habit of preparing notes (changes and improvements) about films I watched. Puri Jagan was introducing Ram Charan with Chirutha when I was doing my intermediate. I went to Puri Jagan and expressed my wish to work in direction department. It was during the time of Magadheera shoot, I have decided to become an actor. There have been a lot of rumors floating around about Chiranjeevi not being invited to Loafer music launch and Puri Jagan’s further comments about Pawan Kalyan’s fans? Puri Jagan is a huge fan of Chiranjeevi and has been wanting to direct Chiranjeevi for a long time. That project didn’t work out and he has directed me now. I was supposed to do Heart Attack, but it didn’t materialize. But we are in good relationship. While we were traveling to Loafer music launch, Peddananna sent a message to Puri Jagan wishing him the best. A day after Loafer music launch, Puri Jagan met peddanna and Chiranjeevi said that he loved the trailer. It’s not possible to answer publicly for each rumor created by others. Allu Arjun was also invited along with Prabhas for the music launch of Loafer. Allu Arjun had some important work. I want to thank Prabhas again for his gracious presence for the music launch. You have seen Loafer. What’s your gut feel about the film? The output of the film is far better than what I had imagined while Puri Jagan narrated me the story. First half will be decent and second half will be emotional. I am extremely happy with the output. I have listened to around 25 scripts and liked a few. Right now, a film each with Krish and Gopichand Malineni is on the cards. 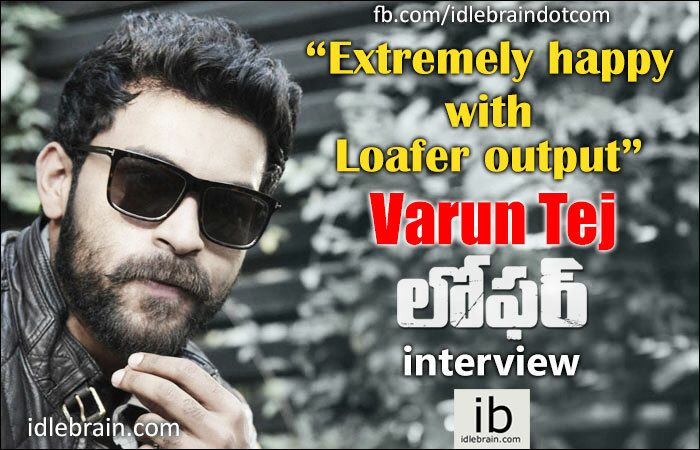 Will get a clarity after the release of Loafer.